Heavenly blog! : No. 881: Man fails always, God never fails! This is something that repeats itself forever! No. 881: Man fails always, God never fails! This is something that repeats itself forever! Man fails always, God never fails! This is something that repeats itself forever! What we are experiencing today that it appears more and more a harlot church where a sufficient love Jesus, but also love everything else. There is nothing new, it's just history repeating itself. Photo by Jan Kaare Hanvold representing harlot church more than any other when he fornicators and operates with heresy. He is one of the many false prophets who would come and appear in the end times. There are those who believe that church life is wonderful and the mustache, but it is to be in a battle zone! Most, not to say everyone, so longs than for a safe haven where one can be allowed to know the security, peace and joy. How should and should congregation been for the individual. Yes, for many it is enough there. But why? Because one has succeeded, willed and ready to compromise with the word of God and his own conscience and adapted apostasy that is prevalent in all churches throughout Norway. And surely, also the western world! When I was ny born I almost thought that the Christians were angels, but without wings. Today I think that Christians are more backsliding than they are living. They are more spiritually dead than alive. They are more like the world than they are like Jesus. They live more in the flesh than they live a life in the Spirit. They are on many ways as Semis raining. They wander simply more of a lie than those walking in truth! The real cap is depressing! I hit on quite so many Christians. They are almost surprised by this. That congregation is more die than live. More apostate one it is true. Obviously, it's a shock when this goes up by one, and it leads to a spiritual crisis for the vast majority, if not for everyone! For my part, as I experienced some of this 20 years ago and it was going in the basement. Do not need to embellish this. But for about good 20 years ago, so it dawned on me that the church is completely off course. In many ways it is quite the opposite one that it should be. But think about themselves that it is on an even keel. Just like the church in Laodicea, so imagines itself that it is something it is not. And what it is, it believes one really is a lie! Laodicean church said about himself as follows: "I am rich, I have abundance and lack nothing." Jesus said the following about the church: "you are wretched, pitiful, poor, blind and naked." Here are the contrasts large, so large that they can not be greater. When the church in Laodicea said it was rich as Jesus said it was poor. When the church in Laodicea said it had abundance as Jesus said it was poor. When the church in Laodicea said it lacked nothing as Jesus said it was naked. When the church in Laodicea said it was super as Jesus said it was pitiful. When the church in Laodicea said it was seeing Jesus said it was blind! The contrasts are large, not least when the spiritual realities goes up for one! But what was a "solution" for me, it was really two things that can and will be of great help to you as well, I am convinced. Firstly, this is the story that repeats itself. And all this has God's word spoken about would happen to the church just before Jesus comes back to pick up the bride - the church. And the Antichrist and the false prophet will arise and rule the whole world against which holocaust and the climax we drifts of Revelation and will end in a bloodbath and inferno of Armageddon mentioned in my commentaries for Revelation. 1. History is full of examples of what we experience today is not unique. 2. God's word has even spoken about this will be the picture of the people and Christianity right for Jesus comes and end times are here. There are many, really many examples. For that it should not be too many, so let's stop at two. Abraham, Isaac and Ishmael, we take first. Abraham had been promised, a son. And it was with Sara. But what happened? Sara was not with child, she could not have children. But what did Abraham and Sarah said? They found something "wise." Abraham had a son, but not with Sara. But by the slave woman Hagar and Ishmael was born. But this was not in accordance with the promise and God. What did Abraham when God gave him a reprimand for this? 1 Genesis 17 18 And Abraham said to God, "May Ishmael might live before thee!" That's how it is today as well, here it is divorced and re-married everywhere, also in the lead. There are female elders, pastors and I do not know what. All this is directly against God's own words, but what would the believers? God meeting us, but not to change anything for us. We want your blessing and renewal, but did not disturb us in our sin. We just want to let "18 And Abraham said to God," May Ishmael might live before thee! ". Man is himself equally, we want sun, but not rain, we want a spring, but not a fall. But all belong together, we can not exclude that one and get the second if it should happen aright. We could have gone further with Abraham, but stops here. Our flesh we want to have top priority, not least if it's gotten there. But it does not, then we will end up with Ismael isdenfor Isaac promised son! The next example I will take, it is about the priest Eli and Samuel. The priest Samuel was a godly man, in many ways a man of God and a priest great for the biblical norm in their own lives. He was a spiritually minded man. But he also had large and dangerous flaws in their lives. He allowed sin in the church, not least among the clergy. There he was not so closely, and let the "watch the world" whiz. This was also his downfall! 1 Sam. 2. 12 Eli's sons were wicked. They knew not the Lord. 13 To behaved priests against the people, When someone brought forth a sacrifice, the priest servant while they cooked the meat. He had with him a three-pronged fork. 14 It stuck into the pan or pot, pan or pot, and everything that came up with the fork, the priest took himself. How did the Israelites against who came to Shiloh. 15 Even before the fat was burned, the priest's servant, and said to those who sacrificed, "Give the priest meat to roast! He will not accept boiled meat from you, but raw. "16 If the man then replied:" First, burn the fat, since you can take whatever you want, "so the servant said," No, give it to me immediately, I will take it by force. "17 The sin of the young men did before the Lord, was very great; they showed no respect for the Lord's sacrifice. It does not help to be a godly man or woman herself, if we team with sin, the world and the flesh. Here were sons of Eli wicked, they knew not the Lord. Here is the Lord's testimony over them: "sin of the young men did before the Lord, was very great; they showed no respect for the Lord's sacrifice. " The same we see today, that the generation who are now grown up, they do not know the Lord and are profligate. They are more Devil messengers than they are God. But they have grown up on a leadership that has been unnfallende, evasive and not been the servants of God have been allowed to got its way and will of God. They are accomplices in this horrible, big and ugly apostasy we see today. 2 Joh.b. 10 If anyone comes to you and does not have this doctrine, receive him not receive in their home, and wish him welcome. 11 For whoever welcomes him, being an accomplice in his evil deeds. and what was done, should be done again. Luke 21 28 But when this starts to happen, then look up, and lift your head! For ye shall be set free. " 1978 translation: 28 But when this starts to happen, then look up, and lift up your heads, because their redemption near. 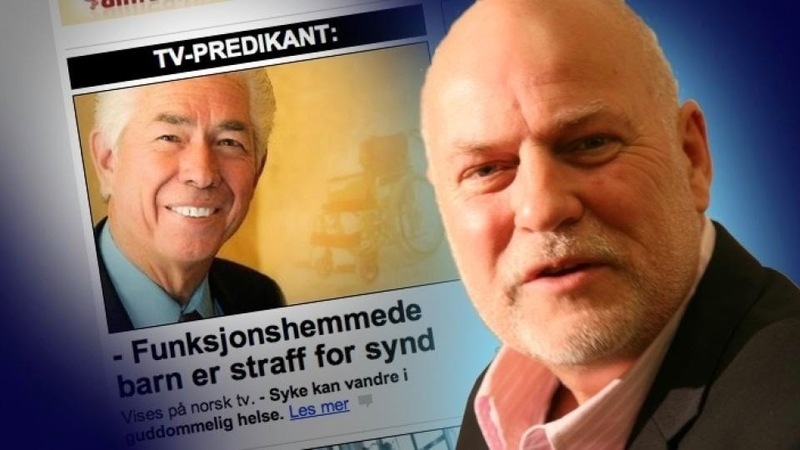 "Apostle" Jan Aage Torp, "Apostle" Jan Hanvold, "Apostle" Ulf Ekman, "Apostle" Åge Åleskjær, "Evangelist" Emanuel Minos, "Evangelist" Svein Nordvik and many, many others are among the false prophets Jesus said. It will in the end times are the following: 2 Tim. 4. 3 For the time will come when they will not endure sound doctrine; but after their own lusts take themselves teachers in droves, having itching ears, 4 and they shall turn away their ears from the truth and turn to adventure. We live in a difficult and time prøvsom word of God says: Matt. 24. 12 And because iniquity shall abound, the love wax cold most. The same says the apostle Paul: 2 Tim. 3. 1. But know this, that in the last days it shall come perilous times. 2 For men shall be lovers of their own selves, covetous, boasters, proud, blasphemers, disobedient to parents, unthankful, unholy, 3 unloving, unreliable, false accusers, incontinent, fierce, despisers of good, 4 Traitors, heady, highminded, lovers of pleasure more than God, 5 having a form of godliness but denying its power - and these should turn away. In the category exists unfortunately Roger Larsson and all too many of today's preachers, leading other believers into the same. Jesus himself said: Luke 18. 8b. But when the Son of man cometh, shall he find faith on earth? When even Jesus throws out such powerful statements, so is not the apostle less: Acts 20. 29 I know that after my departing shall grievous wolves unto you, not sparing the flock; 30 yes, among yourselves shall men leading perverse speech to entice disciples after him. Notice what he says: "after my departing shall come." It was after the apostles were dead that apostasy would happen in full bloom. We see this not least today. It is indeed a troubled time for the true believers today. The apostle John also says the same thing, just in a different way: 1 Jn. b. 4. 1. Beloved believe not every spirit, but try the spirits whether they are of God! because many false prophets have gone out into the world. This was powerful speech, but all biblical men and women are built on the same that the end times will be a delusion time. The apostle Peter also says the same thing but in a different way than the other apostles: 2 Pet. 2. 1. But there arose false prophets also among the people, even as there is among you shall be false teachers, who shall be false teachers that leads to destruction, even denying the Lord that bought them, and bring upon themselves swift destruction. 2 And many shall follow them after their destructive ways, and for their sakes way of truth shall be evil spoken of, 3 And through covetousness shall they with fictional words exploit you gain. But the judgment of them are from of old lingereth not, and their destruction does not sleep. We see this throughout Christendom today, not least among Pentecostal / Charismatics as Roger Larsson belongs. They adhere to fictional teachers, fictional revivals, fictitious doctrines etc. We live in truth in this time. It is only to study what I or have written and what is out on the blog and website. And you wonder something? Then you are welcome to submit your questions to me and although I have taken a break on the blog, so I prioritize to answer questions. Think it's just what I want to do on the blog in the near future, to answer only questions I get, God bless you and yours. Unfortunately it is so, that seduction, apostasy and the many poor shepherds who do not do feed the sheep, but winger cut them. That gets hold on, not just a few days, but actually years and decades. Shall not God stop this? Partially, but they should actually get hold until Antichrist "acquires" the flake worship and requires total submission by themselves, and no other. Then Revelation 17 and 18 come true. Babylon the great whore and her harlot daughters are fallen! But then it's too late and she will get no restoration or new opportunity! Then it is "game over" and the Antichrist and the false prophet occupies the apostate Christendom. And there's much chance that the seat of the Antichrist will be Roma in Italy and he will be a homosexual and a white European with Asian appearance? And with a charisma and radiance has not been seen on! This is the future we can expect, and this will happen when God who knows the end from the beginning has revealed this to us in their own words!